telephone, AC and telescope. The Iris Villa boasts a full kitchen with microwave and coffee maker. An additional stone firering is provided for your outdoor enjoyment (generous bundles of firewood may be purchased). The Iris Villa will accommodate you with an original flare. The hand crafted wood burning fireplace adds a romantic touch. The Villa will accommodate up to four people (queen sleeper sofa). Relax in a secluded terraced picnic area where a large hot tub and gas grill awaits you. Gaze the tops of the Hocking Hills or the heavens and stars with the Villa's telescope. 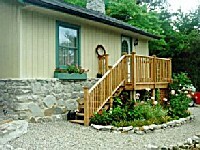 1 BR modern/ romantic stone cottage in the woods. WBFP,secluded hottub, picnic area W/gas grill. Outdoor stone fire ring, telescope. Full kitchen. Linens/towels. TV/VCR/DSS, Stereo/CD, phone, sleeper sofa. Wood/B.Food for weekend guests.